Hybrid organic-inorganic perovskites (HOIPs) have become the most promising next generation solar cell material due to inexpensive processing and high efficiency. Their potential application is, however, currently limited as HOIPs shows structural instability under high temperature, humidity, or even extended light exposure. Understanding of the perovskite structural stability and phase transitions is deemed both timely and essential. Seunghun Lee and Joshua Choi at University of Virginia, in their recent paper on Science Advances, showed that the entropy contribution of the organic cation to the Gibbs free energy plays a crucial role in the crystal structure and its stability in formamidinium lead iodide (FAPbI3). 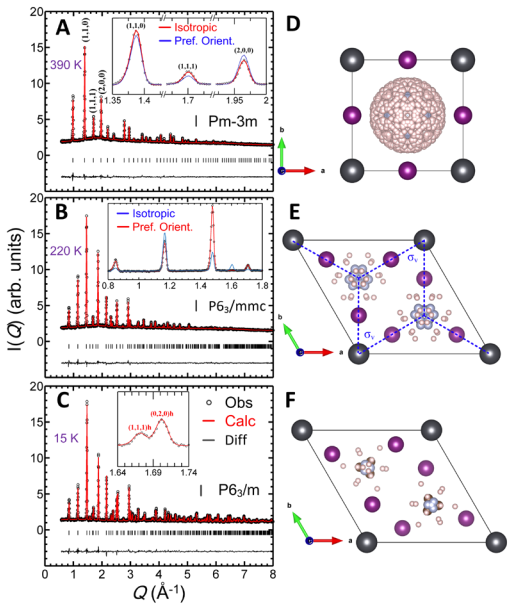 Using neutron and synchrotron x-ray diffraction, they found that FA+ cations have isotropic orientation at high temperature stabilizing cubic phase while they acquire preferential direction at low temperature yielding hexagonal structure. Diffraction patterns of FAPbI3 measured at (A) 390K, (B) 220K, (C) 15K. Refined structures with the symmetry of (D) cubic Pm-3m for 390 K, (E) hexagonal P63/mmc for 220 K and (F) hexagonal P63/m at 15 K. The spheres in dark gray, violet, pink, and light blue represent Pb, I, H/D, and N atoms respectively. The insets in (A) and (B) compare the two different orientation model of FA+ cation. Surprisingly, they observed a large thermal hysteresis in the cubic-to-hexagonal phase transition, which could be understood as the existence of potential barrier confirmed by ab-initio calculations. Exploiting this potential barrier, they demonstrated that kinetic trapping of the cubic phase down to 8 K is possible by thermal quenching. The stabilization of structure with quenching is believed to open a new opportunities for the practical application of HOIPs.